Nintendo Switch owners may still be chomping at the bit for any sort of announcement regarding Nintendo’s Virtual Console plans but that hasn’t stopped publisher Hamster Corporation from releasing their Neo Geo library on the system. While many are familiar with the likes of Nintendo’s NES and SNES systems or SEGA’s Mega Drive, the Neo Geo may be less so, largely thanks to its limited and expensive release back in the 90s. That being said the system was home to a whole wealth of excellent titles and while it may be known as a very heavy fighter and arcade shooter platform, there were also a few other gems to be found from other genres too. 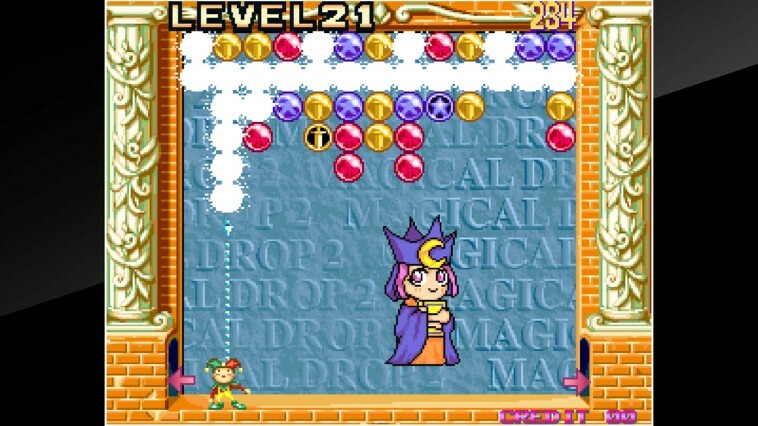 Magical Drop II ticks all the usual boxes when it comes to the puzzler checklist. It uses coloured shapes (in this case balloons), has you creating matches, features unique characters, sports a cheery and bright look overall and of course is devilishly addicting. While its appearance may give the impression it’s merely a Bust-a-Move clone, the actual mechanics are very different. Rounds consist of lines of different coloured balloons dropping slowly row by row from the top of the screen. Using your jester cursor at the bottom, you’re able to move left and right absorbing balloons (multiple if they are of the same colour) and placing them back into the field with the aim of matching three or more vertically causing them to disappear. Any like colours that also happen to touch your newly coordinated column will vanish, potentially leading to a chain. It’s then a case of keeping these continuous rows of balloons at bay and preventing them from reaching the bottom of your screen. Curveballs are thrown your way in the form of special power-up balloons that can both help or hinder your progress. Things like ice balloons that cannot be directly removed but instead need to be touching a matching set or arrows that will fire off in a single direction when triggered taking out anything in its path. If you’re playing alone you have a few options to choose from, all fun if somewhat predictable. 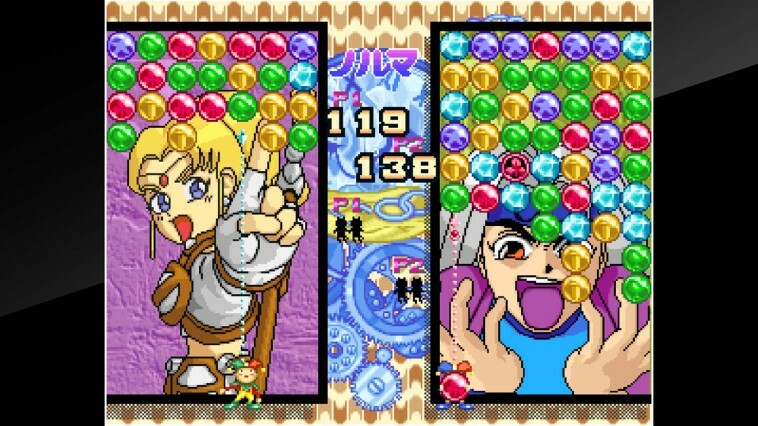 The first sees you tackling a series of increasingly difficult computer players, the screen split down the middle and a winner declared when someone either clears their entire field of balloons or they simply cannot fit any more on their side of the screen. Much like Tetris, scoring long chains makes life difficult for your opponent which in this case means throwing more balloons their way much faster. Fun for a while but best played in short bursts. The next is an endless mode of sorts that has you trying to survive as long as possible on a larger playing field with the difficulty ramping up the further you progress. This mode is fine but not the ideal way to experience the game. The final option is only accessible when you play the Japanese version of the game titled Hirameki mode. Here you’re thrown into situations where the aim is to clear the entire field before time is up. Usually, the balloons are set in such a way that long combos can be formed and an ideal solution be found offering a different approach to the usual random nature of the other modes. Two player battles are where the most fun is to be had though. Just as is the case with most puzzlers, having someone beside you to compete with is much more enjoyable than a faceless CPU. The game’s simple controls also translate very well to a single Joy-Con meaning Magical Drop II is perfect for on the go head to head matches and it’s relatively quick round times mean you’ll constantly be back for rematch after rematch. It’s here also where you’ll have some of your closest competitions, rounds often going back and forth so many times and keeping it very tense and exciting. Visually the game lacks the detail you might see in other games on the system, characters perhaps a little too basic and backgrounds lacking identity. However, it’s bright colours and twee feel certainly gives it a likeable edge. All in all, Magical Drop II is a neat little puzzler. It may not be as complete and polished as its sequel nor have as much content as the likes of SEGA’s Puyo Puyo Tetris but at little over a fiver, it’s hard to complain. An ideal purchase for puzzle fans and a good entry point for anyone wanting to break into the genre.